HARFORD FAIR has a rich and long-time history. 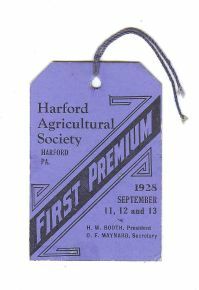 Officially known as the HARFORD AGRICULTURAL SOCIETY, the first fair, with seventy-six members, was held November 9, 1858, in the sheds around the First Congregational Church in the town of Harford. One of the first exhibits recorded was five heads of cabbage each weighing seventeen pounds. 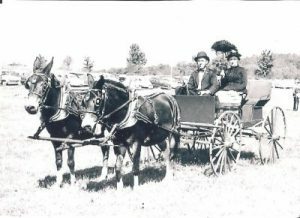 The finale that first year was fifty yoke of oxen connected with one chain parading through the town and drawing several wagons with the Directors and Officials. The one-day event was moved to October a few years later and the entrance fee was ten cents. The main attractions were speakers, brass bands, plowing matches, and, of course, the agricultural displays. The fair became a two-day event in 1865. In 1880, the 117 acre fair grounds hosted 1,000 teams of oxen and 3,500 people. While the acreage has remained the same the number of exhibitors, visitors, and entertainers has grown, as has the length of the fair. The first premium book (or fair book as it is commonly known) was printed in 1903. Now a six-day fair with twenty-three different departments within the fair , it provides opportunities for young and old alike to exhibit handcrafts, school projects, agricultural items, fruits, vegetables, baked goods, animals, photography and art work. Each year, thousands of residents from Susquehanna County as well as adjoining counties exhibit items for competition. The first and second place pie and cake contest winners are auctioned Monday afternoon and the proceeds go to the scholarship fund. There are over 200 commercial space renters who display their wares as well. Highlights of the main arena events include three nights of tractor and truck pulls in addition to the popular annual events of the rodeo, the horse pulls, the woodsman’s contest, the demolition derby, and a featured country western show. At the north end of the main arena is the horse arena which features a variety of equestrian events throughout the week. Daily demonstrations abound throughout the fair which include chain saw carving and stained glass work some of which is auctioned off to the public on Saturday afternoon. Throughout fair week thirteen different acts will perform in the Shade Pavilion providing constant entertainment in a comfortable seated area. From the diaper-clad to the octogenarian, there is something for everyone at the Harford Fair. Play “Farmer for a Day,” learn how bees make honey, or milk a goat. Interesting artifacts which give an overview of the history of the fair can be seen in the Founders Museum and the New Log Cabin. Hungry? Let the dining hall crew heap your plate full of real home cookin’, sink your teeth into a funnel cake, potato pancake, corn on the cob, or baked potato. The fair is a guilt-free zone! Whatever tickles your taste buds can be found at the Harford Fair. Copyright © 2019 | MH Magazine WordPress Theme by MH Themes	Copyright © 2017, by Harford Agricultural Society. All rights reserved.